Make your own turkey cutlets by cutting a turkey tenderloin into rounds and pound flat with a meat mallet. You can also purchase unproccesed deli turkey to save time. Preheat the broiler. Combine 1 tsp paprika, 1/4 tsp salt, and pepper to taste in a small bowl. Arrange the turkey cutlets on a rimmed baking sheet and sprinkle both sides with the paprika mixture. Broil until just cooked through (3 minutes per side). Transfer to a plate and set aside. Combine the vinegar, the remaining paprika, 1/2 tsp salt, and pepper to taste in a bowl. Whisk the oil along with juices from the cooked turkey and 1/4 cup finely chopped tomatoes. Peel and halve the eggs. Remove the yolks and chop the whites and add to the dressing mixture along with the lettuce and remaining tomatoes. Chop the turkey, add it to the bowl and toss. Sprinkle the top with crumbled blue cheese. 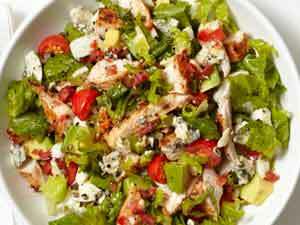 This entry was posted in Chicken, Entrees, Metabolic Medical Center Recipes, Salad, Uncategorized and tagged blue cheese, eggs, hard boiled eggs, olive oil, Paprika, red wine vinegar, romaine lettuce, tomatoes, turkey, turkey cutlets, vinegar by foodies4mmc. Bookmark the permalink.